I hope everyone enjoyed their weeked! How does it always fly by so fast? I didn't get nearly enough of what I wanted done, so I guess I'll have to wait until next weekend. The highlight of my weekend was taking LO to the park, we sat on the grass enjoying the late afternoon sun and then later I put her in the baby swing for a go. She had a blast! I decided to give Jindie Nails another chance, so I tried another creamy neon glitter by the name of Swoon. This is very similar to Rave, except the glitters are neon yellow, blue, and green, with a mix of large hexes, circle, and small square glitters. 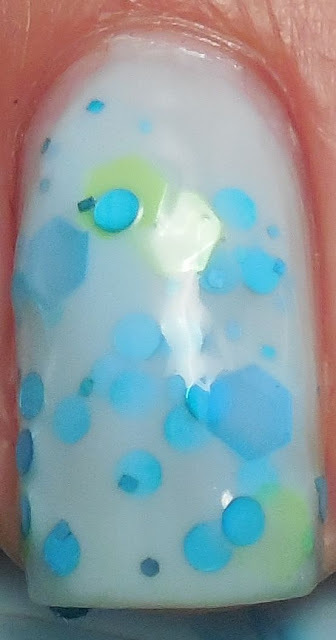 The formula was slightly thicker than Rave but still more watery than I prefer for a glitter, but there was minimal streaking of the blue tinted white base upon application. The glitters wanted to drag towards the tips of my nails though, so I had to dab some for even placement. I used two and half coats followed with a layer of SH Insta Dri. I'm still not quite on the wagon with Jindie Nails due to the less than optimal formula, but I can see why she's so popular with her signature creamy glitters, especially the neon glitters. I do like that the polish doesn't dry gritty or bumpy which may be a benefit of the watery formula. In any case, I'll continue to experiment with this brand because I do enjoy the colors. I have two more for you and hopefully I'll get those up together soon. Thank you! If you ever have any trouble getting any, let me know I'd be happy to help you out!